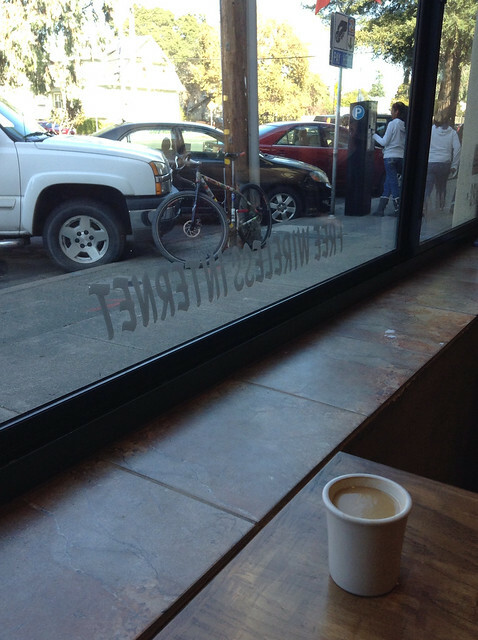 The campaign to hit 7 cafes by bicycle in 7 weekends succumbed to circumstance last weekend. My Saturday bike ride down to the A Street (Santa Rosa art district) to visit the coffee place down there was foiled by the fact that I left the house an hour after the festivities were supposed to be over. I saw a giant-sized bicycle-ish steampunk contraption riding away, and some decent encaustic painting/collages, but couldn’t find any coffee. The Peet’s and Starbucks facing each other across D Street both close at 9pm. Oops. Signs on the sidewalk, lights on, but people cleaning out drains and flushing espresso machines. I wonder if the baristas give each other the evil eye when they lock their doors in unison, or if they go down to get a beer and a shot together. My Sunday plan to ride over to Acre Coffee in the Montgomery Village to meet up with my friend was foiled by a dog door. I’ve had a chore for a couple of weeks now (discharged today), to put a dog door in my mother-in-law’s door, so her Bernese Mountain Dog can let herself out, without the winter air getting in. I pulled the supplied door out of its packaging, and held it up to the door, held it up to the dog, and tried to get Rosie to jump through it. She ran around the yard with the frame around her neck like a collar. So, I took the door back to Pet Whatever, talked them through their return policy and customer service (maybe I could order it online? “I thiiink you can use the credit online.” Is there a nearby Pet Whatever that might have it? “Oh no, the closest one is in Petaluma.” I’ll go there. Can you call and see if they have one? “What? Oh, sure, I could do that. Just wait ten minutes while I deal with this sudden deluge of high-maintenance customers”), then drove 20 minutes to get the in-stock LIVESTOCK sized dog door. The whole transaction put me arriving at Acre Coffee exactly on time if I drove, but 20 minutes late if I stopped off to switch to a bicycle. Which would be stupid. My friend and I had a great two hour visit, gave directions to two people – a possibly homeless man (cleaned and well-clothed in a Western Farmer style, but semi-incoherent and pushing a pram with a LOT of stuff in it) who needed to find his doctor’s office (for an appointment the next day – best to be prepared); and a woman who had driven 5 hours from Eureka, bound for Martinez. She’d gotten off the highway 20 miles too early, mostly because she was tired of driving. She was bound on driving through Sonoma on 12, which would not have helped her situation. The Acre espresso is Portland Style, slightly muddy, but tasty. Interior design is very good, but the Petaluma one is better. But it doesn’t count, since I didn’t cycle there. Yesterday, my plan to bike cycle with the dog to the coffee stand at Pacific Market like I’d done the other week was foiled by my friends and their dog knocking on my door to make sure the kid birthday party was still on for 2pm. I was like, “Yes, plus let me get my clothes on so Chick and Duke can walk together!” The dogs LOVED that. Long walk through downtown, back to the friends’ house, and then hot-foot back home to prep for the party. No riding, no coffee. Today, I actually got an Americano at Holy Ground (tasty), by bicycle, as part of my three-part odyssey to get the Gravel Roadster hooked up tubeless. Bike Peddler guys are super-awesome, Big Apples are too loose to go tubeless, but Marathon Supremes will. Supremes look like regular road tires next to Big Apples. Honorable mention! Thanks for doing all the rides you did.